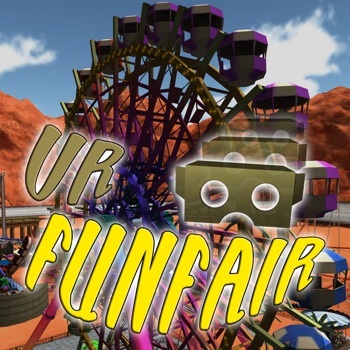 VR Funfair - An entire amusement park in one app! Welcome to VR Funfair! The ultimate VR-Kick offers 24 ride and a whole lot of fun! This game is compatible with VR headsets such as Google Cardboard, Durovis Dive and ZEISS VR ONE. Just start, select your ride (by looking at the center for a couple of seconds), and enjoy; no touch controls needed for menu or game control. Due to the elaborate VR Graphics, VR Funfair only works on current models of the iPhone, iPod touch or iPad. For lower-end devices, we recommend the dungeon game "VR Labyrinth". If you like VR combined with Speech Recognition, play "VR - Talk to her".